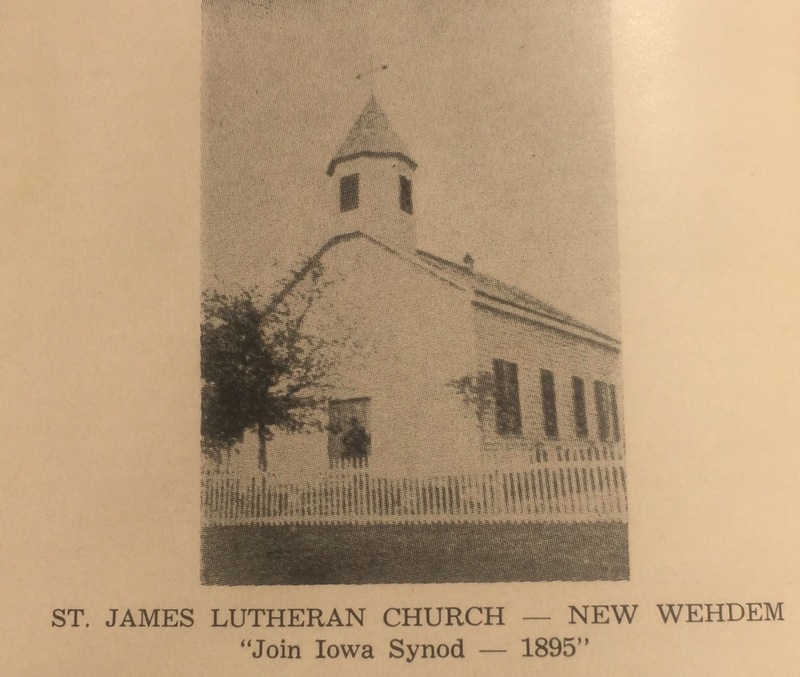 This is a history, or more accurately, a chronology, I put together to get my mind around the expansion of the Lutheran Church in this part of Texas. To the best of my knowledge, Lutherans began settling in Texas in the early 1800’s, but until 1836, on Roman Catholicism was allowed, so Lutherans worshipped in homes. Over the next several decades congregations and synods would form to establish the work of the church in this “new” land. This page will begin to provide online access to the history of Lutheranism in Texas. Below are some of the sources for this information. 1821: Mexico wins its independence from Spain. Immigration is now permitted. Married men are granted 4,428 acres. Colonizers bringing in at least 100 families are granted 23,000 acres as a bonus. People begin arriving from New York, Pennsylvania, Virginia, Ohio, Georgia, Alabama, Mississippi, Tennessee, Arkansas, Missouri and abroad. Mexico, like Spain, however, forbids any religion except Roman Catholic. So Protestants do not yet openly have Sunday schools or church buildings. Methodists hold services on the Texas side of the Sabine River. Lutherans and others meet in homes. 1824: Independence, Texas, originally called “Coles Settlement,” has its beginning on land granted by Mexico to Judge John P. Coles, but is later renamed Independence in honor of Texas’ declaration of freedom from Mexico. 1830: Colonizer Stephen F. Austin makes plans to bring German and Swiss immigrants to Texas. 1834: Robert Kleberg establishes Cat Spring (or Wildcat Spring), Texas. 1836: Texas wins its independence from Mexico at The Battle of San Jacinto and becomes a country: The Republic of Texas. Sam Houston is elected President. The ban on Protestants is lifted. 1837: William Frels establishes Frelsburg, Texas. Washington County is founded. 1838: Swen Swenson of Sweden confers with President Houston about bringing a group to Texas. 1839: The Rev. L. C. Ervendberg from Illinois comes to Texas and gathers a congregation in Houston. 1840-1846: 7161 immigrants arrive during this six-year period from Bremen, Germany. 1840: Pastor Ervendberg establishes preaching points in Industry, Cat Spring, Beigel Settlement, La Grange and Columbus. 1840: Houston’s German population reaches 400. A German Union is established by the Texas Congress. 1842: The Society for the Protection of German Immigrants in Texas is formed. More commonly known as the Adelsverein, was a colonial attempt to establish a “New Germany” in Texas. 1843: On January 9, 1843, Count Ludwig Joseph von Boos-Waldeck buys a 4,428-acre Nassau Plantation in Fayette County, two miles east of Round Top, for $0.75. The plantation is maintained by slave labor and operated for the recreational pleasure of the Adelsverein. The plantation is the primary base for arriving German immigrants. Twenty-five slaves are bought to work on the property. Prince Solms inspects the plantation in 1844, and recommended the Verein divest itself of the property, rather than be associated with slavery. Gustav Dresel, Special Business Agent for the Adelsverein, sells Nassau plantation on July 28, 1848. 1844: John Pierson of Norway, in Austin, makes plans to bring a group from Norway. Brenham is established, named after Richard Fox Brenham, a hero of the Texas Republic. Five Adels-Verein ships arrive in the second half of 1844, bringing 439 people (many of whom were impoverished) in 103 families, with 134 children. They settle in a tract of land bought by Prince Carl of Solms-Braunfels, at Indian Point on Matagorda Bay, about ten miles south of Port Lavaca. The settlement is called Carlshaven, and later Indianola. 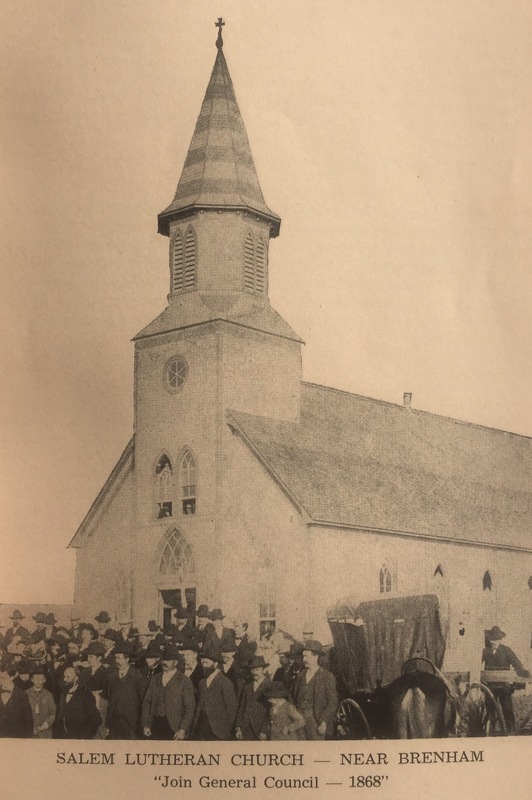 Pastor L. C. Ervendberg conducts services there on Christmas Day in 1844. Songs are composed like Hin nach Texas! 1845: On March 2, 1 o845, The Republic of Texas becomes the 28th state of the United States of America. On March 21, 1845, 200 colonists from Indian Point and other places found New Braunfels. Pastor Ervendberg goes with them. He serves as pastor, teacher, probate judge and founder of the Western Texas Orphan Asylum, author of school laws, and president and sole teacher of the West Texas University. 1845-1846: 5,247 more Germans arrive in Galveston. They winter in tents at Carlshaven. Hundreds don’t survive the winter. 1846: April 24, 1846 a group leaves Carlshaven in 29 Mexican ox carts. On May 8, they begin a new settlement called Fredericksburg. May 13, 2846, the U.S. declares war on Mexico. 1847: Chappell Hill is founded by Mary Hargrove Haller, granddaughter of Robert Wooding Chappell. The tiny town will in time establish two colleges, Chappell Hill Female College and Soule University, which will later become part of what is now Southwestern University in Georgetown, Texas. 1849: Mr. Christian Spittler at the St. Chrischona School of the Pilgrim’s Mission in Basel, Switzerland, receives a couple letters from Texas requesting leaders to bring education to the native populations of Texas, and relieve the spiritual needs of immigrants. 1850: Texas population reaches 208,000, including 58,000 slaves. The Lutheran Synod of South Carolina sends Pastor G. F. Guebner to make a trip through the state to analyze the mission field. He organizes a congregation in Galveston and stays a few years. Guebner marries someone in Fayette County in the 1850’s according to records. 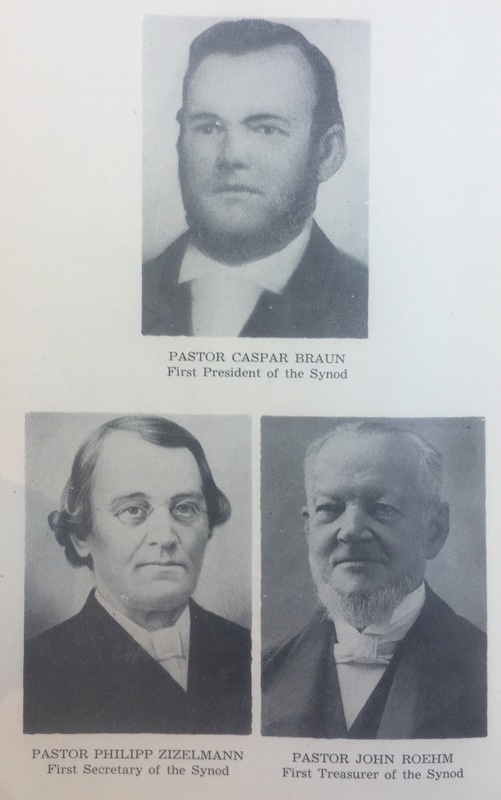 Pastor Casper Braun (1822-1880) arrives by boat from Pittsburgh, Pennsylvania to Galveston and then on to Houston. Pastor J. Heinrich Braschler (1818-1860?) serves settlers in Spring Branch (25 miles NW of Houston). The St. Chrischona School of the Pilgrim’s Mission in Basel, Switzerland sends Theobald G. Kleis (1826-1853) and Christoph Adam Sager (1826-1869), ordained on March 17, 1850) were among them. Both went to Victoria. Sager stays in Victoria and Kleis goes up to Neighborsville and Hortontown, on the opposite bank of the river from New Braunfels. 1851: July 1, a Lutheran Church is established in Houston (now First Evangelical Lutheran Church, NALC, in Houston). The St. Chrischona School of the Pilgrim’s Mission in Basel, Switzerland sends its entire graduating class of six to Texas: Johann George Ebinger (1828-1908), Christian Oefinger (1825-1869? ), John Conrad Roehm (1822-? ), William T. Strobel (1823-? ), Heinrich (Henry) Wendt (1825-?) and Philipp Frederick Zizelmann (1824-1902). They board the Franziska at Bremen on September 2, setting foot on Galveston Island two months later, on Wednesday, November 5, 1851. They find a congregation of seven families in Galveston. The founding pastor, Guebner, has left. Wendt remains in Galveston. The remaining five go by boat up the bay and up Buffalo Bayou to the Port of Houston at Main Street, to consult with Pastor Casper Braun, days after arriving in Galveston. On Thursday, November 13, 1851, the day after the last day of the synodical session, Oefinger, Rohm, Strobel and Zizelmann pay $10 each for a stage coach to La Grange, from which they hope to find a way to New Braunfels. They leave at 4 a.m. and spend the first night in Washington. By Sunday night they are in La Grange. Monday they set out on foot for New Braunfels. It is agreed that Zizelmann will stay in La Grange. After an hour they sing a stanza of “Jesus Still Lead On” and part company. Six days later the group of three arrive at Pastor Kleis’ home. Kleis has established a Free Protestant church in New Braunfels. 1852: The 2nd convention of the Texas Synod is held in Victoria. The Evangelical Lutheran Church in Victoria is organized (now Trinity, Victoria). 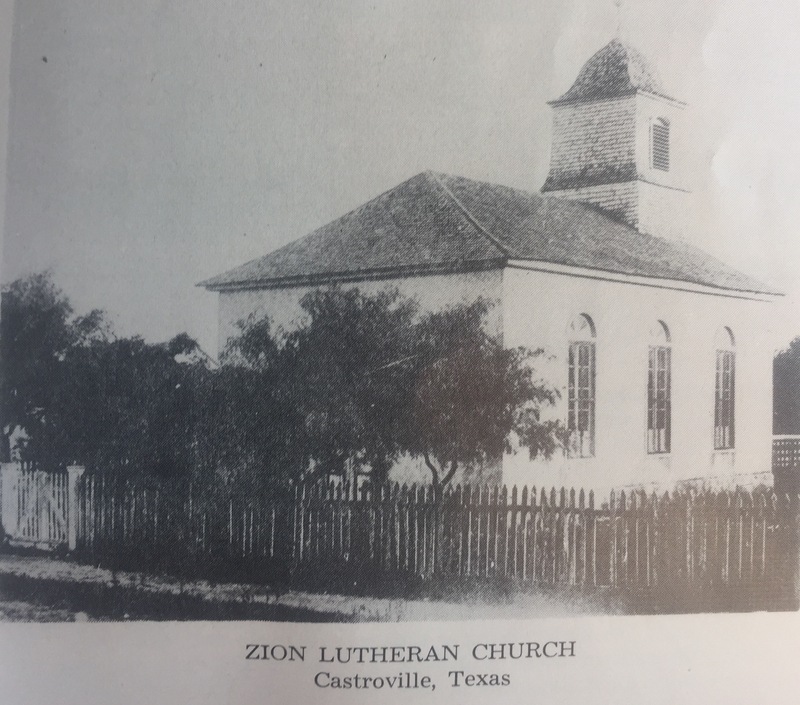 Zion in Castroville is organized on January 29 with Pastor Oefinger. Pastor Roehm marries someone at Ross Prairie in 1852. 1852 or 1853: Pastor Theobald Kleis moves to Johnstown, Pennsylvania for health reasons. He establishes Zion Lutheran Church, then dies at 27 years of age. Pastor Roehm becomes associate with Wendt in Galveston. 1853: The 3rd convention of the Texas Synod is held in Galveston. The decision is made to apply for membership in the General Synod of the Lutheran Church in America. This application is accepted. Roehm moves to the hill country around Meiningen, Castell, Schoenberg and Mason. A Pastor named Otto Haun is serving in La Grange and Round Top. 1854: First Evangelical Lutheran Church in Houston builds its first church building. The 4th Texas Synod convention is held in Castroville. Braschler is approved for ordination. On August 13, 1854, St. Martins in New Braunfels is organized, with Pastor Braschler? Pastor Ebinger is now serving in Brenham. Pastor Strobel leaves Victoria and assumes a new mission in Comaltown, east of New Braunfels, he soon has 136 members and a school. 1855: The fifth convention of the Texas Synod is held in Fredericksburg. Pastor Johann Ebinger conducts the first service in Washington County, eventually forming Eben Ezer Lutheran Church. Pastor Sager moves to Meyersville, from which he will launch worshipping communities in Goliad and Yorktown. The first Lutheran church is organized in the Berlin community of Brenham (now Ebeb-Ezer). They soon have 40 members. Pastor Roehm assumes Frelsburg, where he would stay 22 years. First Galveston buys the Lyceum building. Wartburg Seminary is founded in Iowa. 1856: The 6th Texas Synod convention is held in Comaltown. Pastor Johann Ebinger and a group leave Eben Ezer, establishing Salem, in Brenham. Pastor Wendt leaves Galveston abruptly. There is some written hint of financial misconduct. Later he will be suspended from the Pennsylvania Synod, arrested and found guilty in Philadelphia of charges unknown. After several years in prison it is rumored that Wendt returned to Germany. 1857: The convention of the Texas Synod is held in Frelsburg. Pastor Brascher departs St. Martin’s in Neighborsville (New Braunfels) for Pennsylvania. The Lutheran Church in Comaltown unexpectedly dissolves and Pastor Strobel also leaves for Pennsylvania. The Lutheran Church in Brenham splits, and Salem Lutheran in Brenham is formed by Pastor Ebinger. They soon have 100 members. Round Top is received into the Synod..
1859: Zizelmann moves to Pennsylvania. 1860: The Texas Synod meets in Round Top. Pastor Ebinger takes the call to Galveston, then leaves for Germany never to return, due to an eye ailment of his wife. Castroville and Quihi erect stone churches. 1861: The Texas Synod convention is held in Quihi. Pastor Oefinger leaves for Germany. 1862: The Texas Synod convention is held at Ross Prairie. 1863: The Emancipation Proclamation. The Texas Synod did not meet 1863-1865 due to the war. 1865: June 2, 1985 the Trans-Mississippi Army surrenders. Juneteenth. June 19, 1965, Union General Gordon Granger, having just arrived in Galveston a day earlier, announces from the Balcony of the Ashton Villa, General Order Number 3, that all slaves are free. There are 1,000 slaves in Galveston-Houston, and 250,000 in Texas. 1866: Round Top Church (now Bethlehem) organizes. 1868: The 18th convention of the Texas Synod was held at Salem in Brenham.The Texas Synod severs its 15-year relationship with the General Synod “because in language and doctrine we are not on common ground.” This is likely because the Lutheran Church in America has no English-language seminaries or textbooks, so many of the pastors have been educated in other Protestant seminaries. General Synod was not loyal to distinctive Lutheranism. The Texas Synod affiliates with the General Council of The Evangelical Lutheran Church in America, organized 1866. Galveston erects their first building. New Ulm Church organizes. 1869: The 19th Texas Synod convention is held in San Antonio. Pastor Oefinger dies. Christoph Adam Sager dies of typhoid fever at the age of 43. He is buried at Arneckeville, and is an ancestor of Pastor John McCullough-Bade (deceased) and Pastor Lawrence Bade of Brenham. Welcome (near Industry) organizes. New Wehdem Church (near Brenham, Bishop Tiemann’s home congregation) organizes. 1872: Columbus church is planted. 1876: The Texas Synod convention is held at Zionsville, near Brenham. Pastor Roehm is the senior pastor in the synod. Roehm takes a call to Galveston. Casper Braun becomes Missouri Synod. 1877: Prairie Hill Church (now St. John’s, near Brenham) organizes. 1879: 22 members bring charges against Casper Braun. He is dismissed from the Missouri Synod but refuses to leave his congregation. A group breaks off from First in Houston to form Trinity in Houston (now LCMS). 1880: Casper Braun dies at 58. He is buried at Houston’s Glenwood Cemetery. 1883: Blinn College is established in Brenham. 1889: The Texas Synod convention is held in Arneckeville. Consideration is given to joining the Ohio, Iowa or Missouri Synods for confessional reasons. 1890: The Texas Synod convention is held at Salem Brenham. In July, five pastors leave the General Council for the Ohio Synod. Grueber is among them, but his congregation (Rehburg, near Burton) stays with the synod, while retaining Grueber. Three leave for the Southern District of the Missouri Synod, including Pastor Jesse at Salem. Salem releases Pastor Jesse and stays with the Texas Synod. Same with Pastor Sieck at Berlin. St. Paul of Philipsburg in Brenham is formed. 1891: The Texas Synod convention is held in Victoria, where Pastor Weiss is host. Pastor G. Stricker was elected president. 1892: The Texas Synod convention is held in Yorktown. Johannes Roehm becomes associate pastor at Galveston with his father John Conrad Roehm. 1893: The Texas Synod convention is held in Brenham. 1894: The Texas Synod convention is held in Quihi. 1902: Zastor Zielmann dies as the age of 78. 1908: John George Ebinger dies at the age of 80. 1920: The Texas Synod convention was held in La Grange. 1923: The Texas Synod convention was held in Taylor, Texas. 1924: The Texas Synod convention was held in MacGregor. 1930: The American Lutheran Church is formed. The Iowa Synod, the Texas Synod and the Buffalo Synod become part of that merger. 1962: The Lutheran Church in America (LCA) is formed. 1988: The ALC, LCA, AELC and some other bodies merge to form The Evangelical Lutheran Church in America (ELCA). Flachmeier, William A. Lutherans of Texas in Confluence: With Emphasis on the Decade 1951-1961. Southern District of the American Lutheran Church, 1972. Hoffman, Malcolm; Kelling, Ruth Bohls and Pfennig, Robert; Oelke, Luther, ed. From Merger to Merger: History of the Southern District of The American Lutheran Church. Evangelical Lutheran Church in America Region VI South Archives, 2011. Ziehe, H. C. A Centennial Sotry of The Lutheran Curch in Texas (1851-1951); Section One: The Church Was Planted (1851-1876). Seguin: South Texas Printing Company, 1954. Ziehe, H. C. A Centennial Sotry of The Lutheran Curch in Texas (1851-1951); Section Two: The Church Did Grow (1876-1951). Seguin: South Texas Printing Company, 1954.